Our addiction to mobile phones and other mobile devices has opened up a whole new marketing avenue for any and every type of business, big or small. If you don’t have a business mobile app, it’s time to claim your own slice of the pie that’s held in the hands of millions of users every day. If you’re the first of your competitors to have a mobile app developed for your business, you’re already going to be way ahead, especially in terms of remaining visible to customers on their mobile screens and increasing brand recognition. Remember, every time anyone unlocks the screen of a mobile phone they will be reminded of your company. This type of brand recognition is subliminal too, the image of your slogan or brand is virtually impossible to forget once it is recognised on both a subliminal and visual basis. You don’t have to be a major corporation to have a mobile app; if you are 1 of 20 hairdressers in your area with an app that offers loyalty rewards or specials, there is no doubt that the next time a client needs a cut, it’s you they’ll remember first. A mobile app is a great marketing tool that can be integrated with social media sites, allowing your customers to share your app or their experience of your service with friends and family, which is great free advertising. As a marketing tool, having a mobile app helps you keep customers updated with any promotions you may have in the pipeline, or to make them aware of upcoming special events they need to make space for on their calendar. If a customer is just a tap away from making a purchase from you without having to go to your website, thumbs up to you for bringing in extra income. Make bookings easy for those wanting to visit your restaurant or buy services, and without a doubt you’ll grow your customer base. We want it quick, we want it fast and we want to be able to do all of these things 24/7 by tapping an app on a mobile phone. Still wondering why you need a mobile app to beef-up your marketing strategy? Stop wondering and contact the team of mobile app developers at Netgen to make elbow room for your company on the screens of millions of mobile phones and devices! 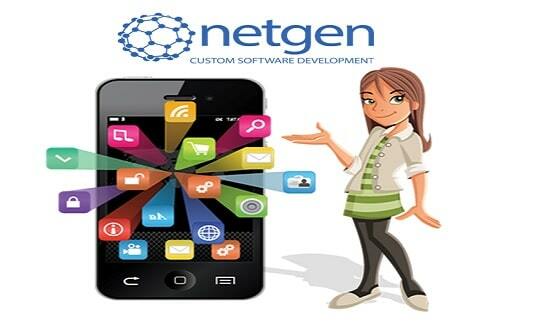 In fact, if you want to go the full distance from website design to online marketing strategies, straight up to the inclusion of a mobile app, then Netgen is the go-to team for you! In addition to the many mobile apps developed in South Africa, Netgen has also developed specific affordable software programs for use by various industries to make business-on-the-go simple and straightforward, with resounding success. Web solutions are what this team lives and breathes, which means that whether you need a website designed, a mobile app or custom software developed, they’ll have an answer to suit your requirements and your budget.